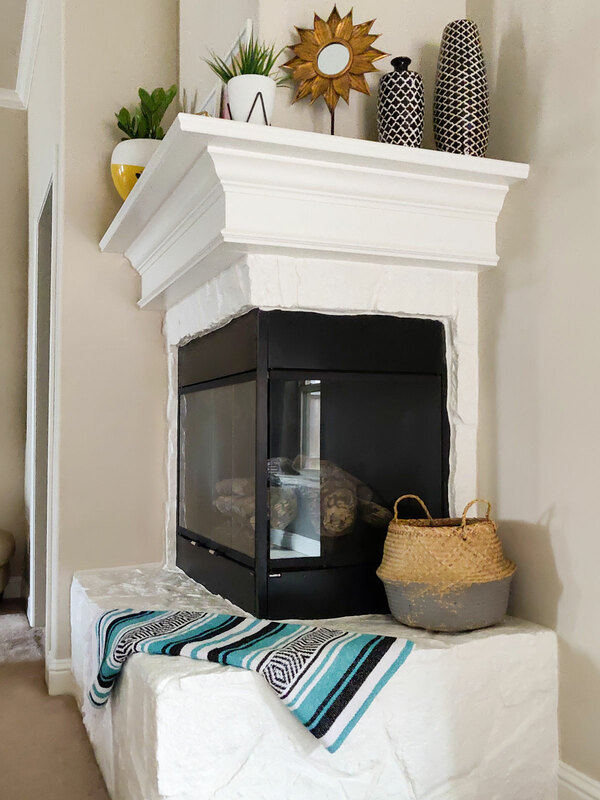 I’ve been admiring white fireplaces for some time now and wondered if I should take the plunge and paint ours. I knew that once I did, there’s no going back — and that’s kind of scary! But, I dove in full force and finally did it. I’m SO happy with our white stone, and wish I had painted it months ago! If you’re in the same boat and debating if you should brave a similar project, take a look at my before & after shots to help guide your decision! Here is what we were dealing with before. I didn’t mind the stone when we moved into our home back in 2010. But as my style continues to change over time, I started to feel like it just stuck out too much. Since we upgraded our entertainment center, I’ve been wanting to brighten up our space even more. I absolutely love the outcome! 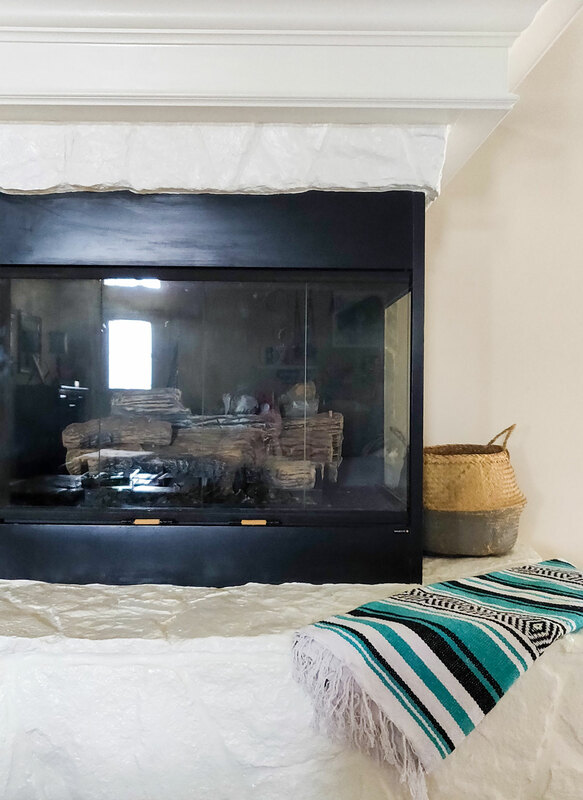 Ignore the dust in the fireplace here.. haha, it needed a VERY thorough cleaning! Tada! So fresh and so clean!! 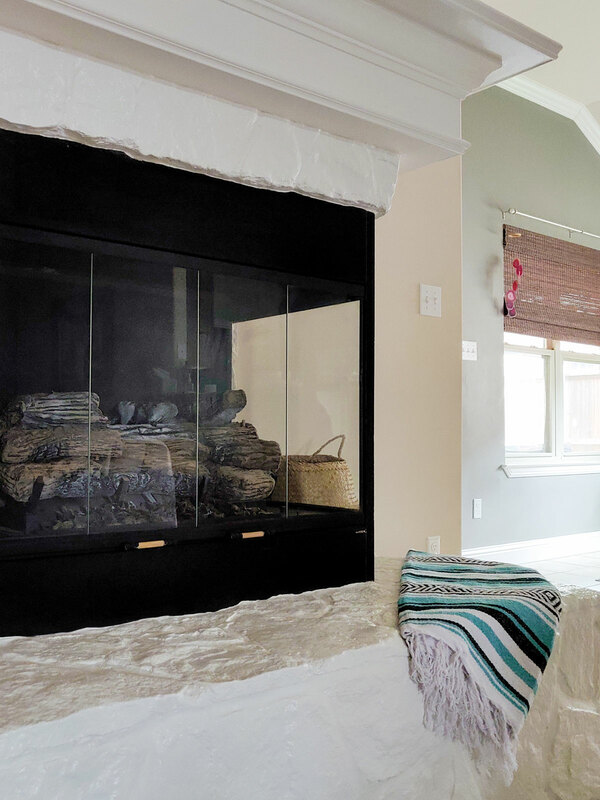 My husband loves it just as much as I do, so I would call this makeover a huge success. The mantel got a fresh coat of paint as well. I used Kelly Moore Acoustic White, which is the color of the trim all through out our house.  Are you persuaded yet? I’ll explain the steps to follow below! First, you’ll need to prime your brick or stone. I used Zinsser Bulls Eye 1-2-3 Primer. It’s water based for indoor and outdoor, and great for all types of surfaces. As you can see here, I chose to not tape off my edges. 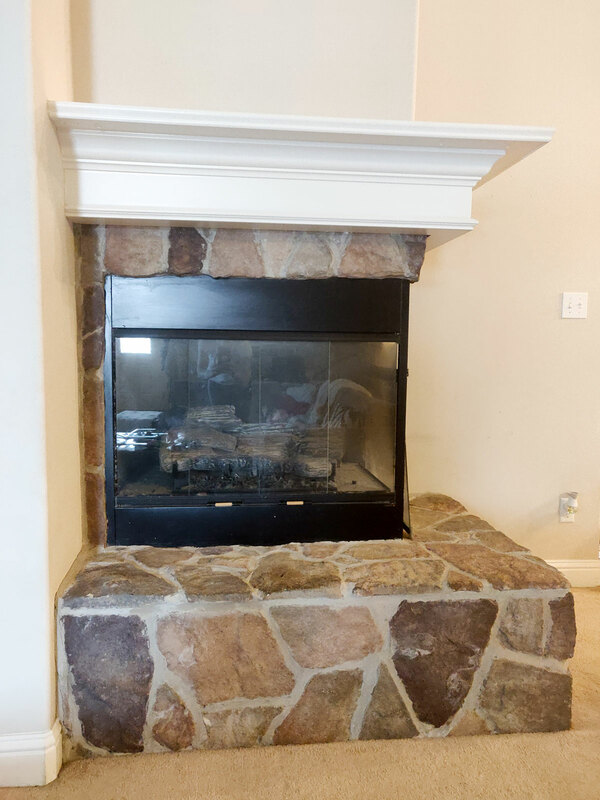 I normally would, but the stone and grout made some pretty uneven edges along the fireplace metal insert. Also, I was out of painters tape and didn’t want to make a special trip. I was eager to get to work, but extremely meticulous around those edges. 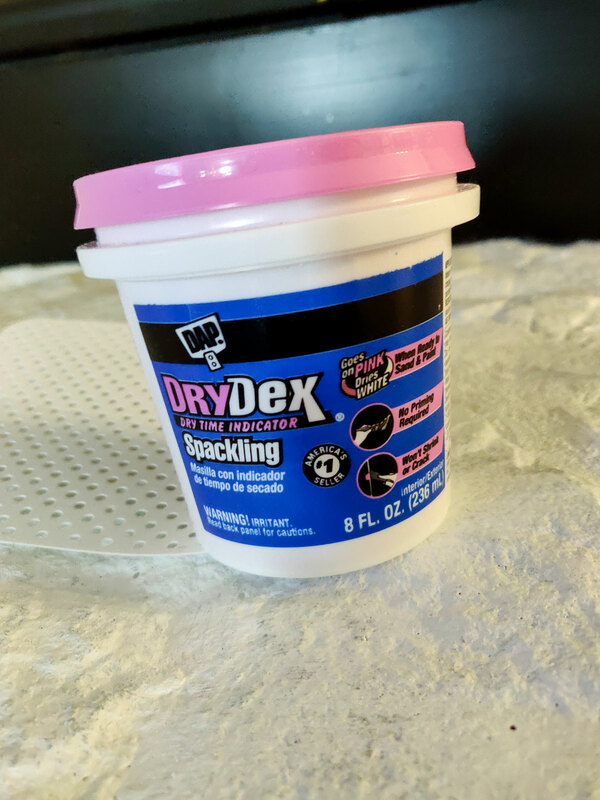 Once my primer was dry, I filled in gaps and porous spots with this DryDex spackling. This helped “smooth” any obvious cracks between the grout and stone and helped the area look uniform. After it’s dried, sand down the spackle that left rough edges. Here is a shot of how it looks after the primer and spackle. To clean up the edges, just use a wet wash rag to wipe away any spackle left behind. This was a little messier than the primer along the insert. I made sure to cover any gaps where the grout touched the metal and wall. 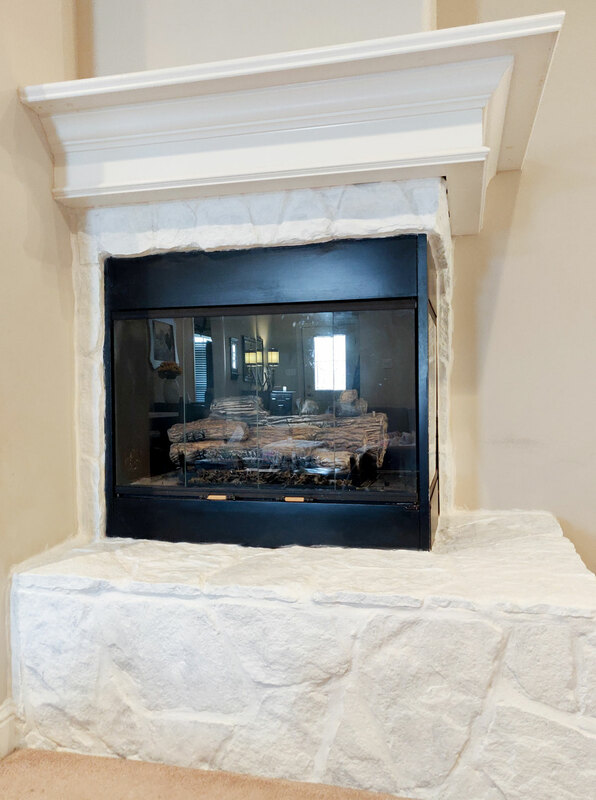 You can see here that there are a few spots near the bottom of the mantel where there were noticeable gaps. I applied caulking to fill those in. 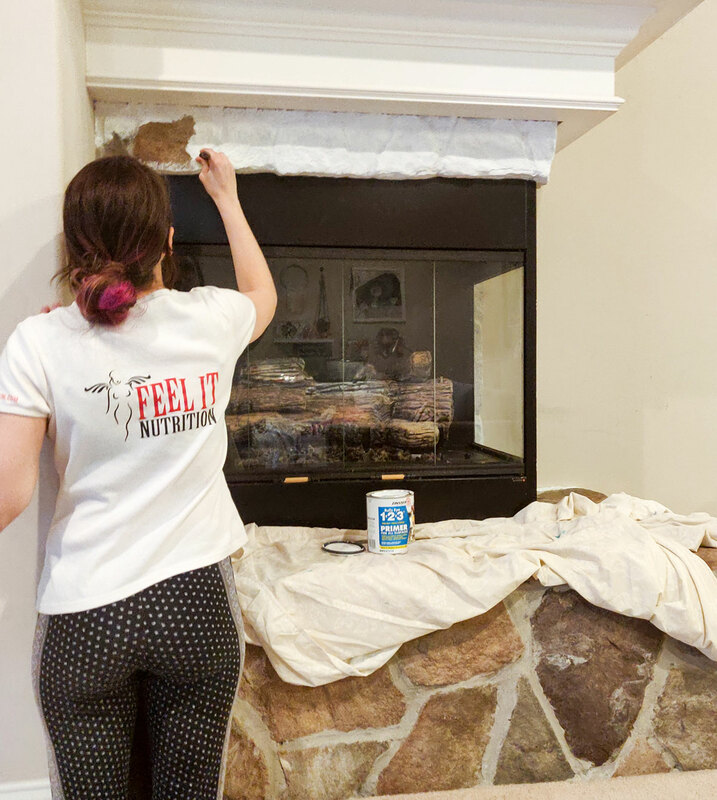 Once your brick or stone is primed, spackled, and caulked, it’s ready to paint! I have our wall color on hand for touch ups, so I used a small brush to clean it up and get those super straight edges when I tended to “color outside the lines”. 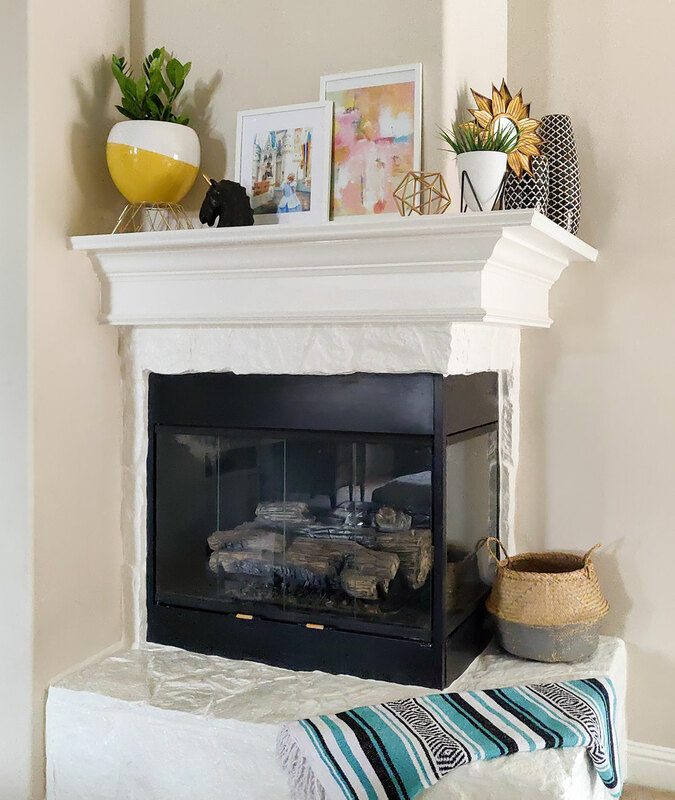 Our mantel trim has some pretty curvy areas. Taping that off would have been a nightmare! That’s all there is to it! 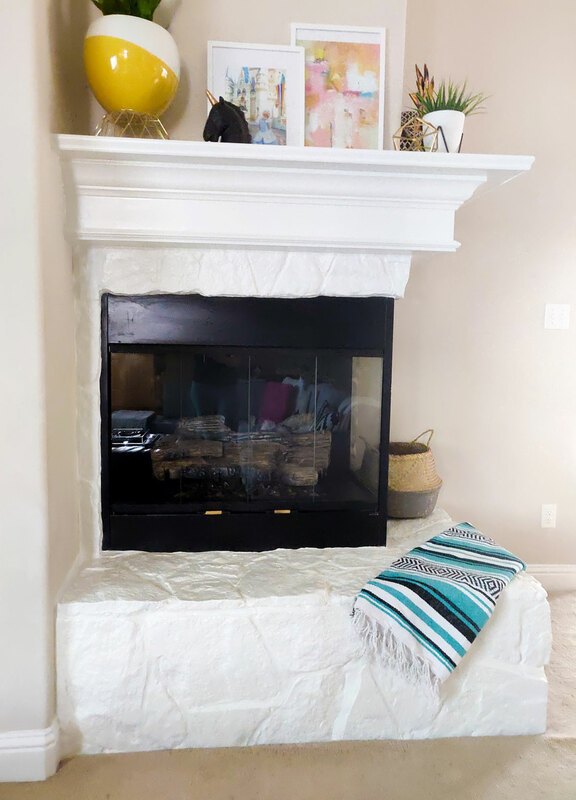 I couldn’t wait to add my decor back to our newly revamped fireplace. I found this beautiful teal Mexican blanket coming home from our latest trip to Beaumont. It looks so pretty against the white stone! This makeover has made such a huge difference. After our friends and family have seen it, they tell me how it’s made our living room seem bigger and brighter. I agree, I can’t stop staring at it! 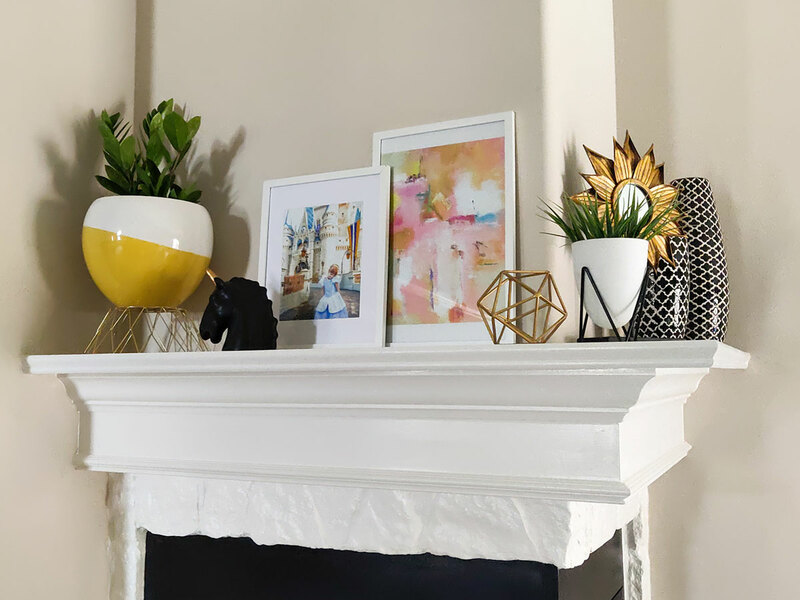 Our mantel was desperate for a fresh coat of paint and it looks a thousand times better now. I didn’t realize how dirty it had gotten in the last 8+ years! I can’t wait to decorate this space and see how it looks for each season compared to before. Our next mission is to replace our carpet with wooden floors. One step at a time! So there you have it — such a drastic transformation with a little effort. I hope this post has swayed you to take the same plunge! If you’re like me, you’ll be so happy you did!